PHILADELPHIA, PA – October 12, 2017– Janney Montgomery Scott LLC (“Janney”), a leading full-service wealth management, financial services, and investment banking firm headquartered in Philadelphia, PA, announced the hiring of Andrew S. Vitek, First Vice President/Wealth Management to the firm’s Wyncote, PA branch office. 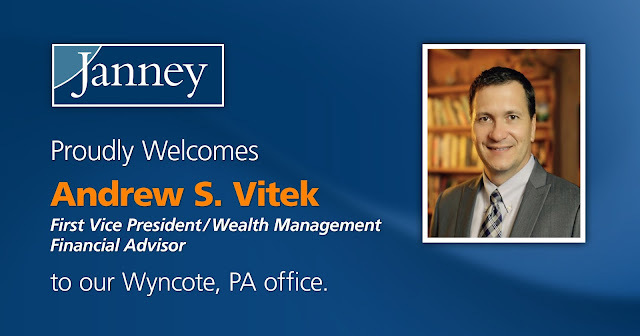 Vitek, who is joined at Janney by Donna E. Kennedy, has over 24 years of financial services experience and was previously affiliated with Wells Fargo Advisors. Janney’s Wyncote, PA branch office is located at 8101 Washington Lane, Suite 100, Wyncote, PA 19095.